It may be illegal to do piracy, but using torrent is not. Torrent is just based on the simple networking basics i.e. peer to peer connection. It is a type of file sharing system, and the legalities will depend on which file are you sharing. But one thing that bugs us all is the ads that are displayed inside the client. Different torrent client includes uTorrent, BitTorrent, Vuze etc. So today I will show you how to hide ads in torrent client. Remember this option is given inside the client, so we are not doing anything tricky here, if you know what I mean. How to Hide Ads in Torrent Client? 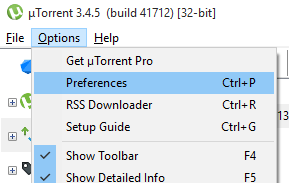 Depending on which torrent client you use, the options names might defer so you need to experiment with it. If you are unable to do it with your client, then you can shift to uTorrent and follow the steps. Launch your torrent client, in my case it’s uTorrent. Go to Options and then preferences. 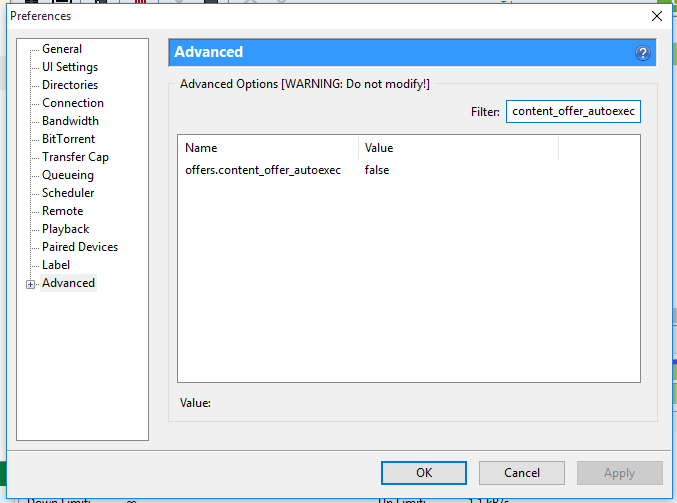 After that expand the Advanced option where you will see a warning message saying – Do not modify! Now we need to carefully change some of these options to False. You can use filter to search for the options given below. After you have completed, click “OK” to see the changes reflect. This is the how simple it is to hide Ads that are displayed in Torrent Clients. I know this is not a great trick, but it does feel good after all the Ads are gone. Moreover you only have to do it once, after that you can continue downloading stuff with peace. Take extreme caution while changing anything and see to it that you only change the options mentioned above or else you will end up with faulty client. Do let me know if it worked for you. If you have any doubts please post them in the comment section below.